The Cigarette Comic is a set of 20 micro-comics about smoking, packaged in a box to look like a pack of cigarettes. It was the first issue of Attempted Not Known to take the form of what I now call a comic/object. I had already published eight issues as booklets, and learned a lot—mainly, that people do indeed judge a book by its cover. Issues 5-7 had some very interesting work inside, but they were printed in black ink on newsprint and no one bought them. They didn't look exciting. With issue 8, I tried a hand-cut window in the cover. It worked! People really showed interest in the book, because it was clear that I had put some work into it. So, for Attempted Not Known #9, I decided to go a step further and build a comic in a format that would really stand out. 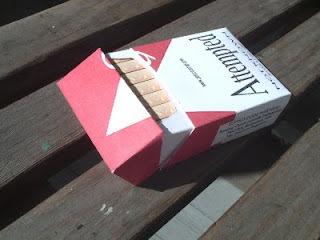 I noticed other artists starting to do interesting things with their packaging. 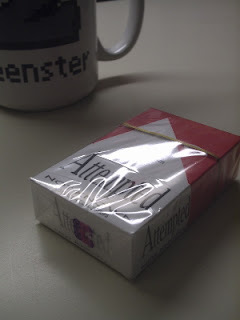 I had been interested in the design of the cigarette box for years, and I thought a set of comics about smoking would be a provocative subject. Drawing the comics, of course, turned out to be the easy part. The tolerances for the box are very precise, which makes sense in a production environment where the boxes are die-cut by the thousands. It took a certain amount of effort to create my own box design using the Linux tools that were available at the time. It was difficult to find paper thick enough to stand up as a box, but thin enough to run through a printer; shiny enough to look realistic, but matte enough to take ink. I struggled with a number of prototypes which gradually got better and better. Some of the early ones that I sold were salmon-colored, because I hadn't yet found a paper and printer combination that worked. At one point, I decided it would be nifty to package some of them in plastic, complete with California tax stamps. I placed an ad on Craigslist, specifying the brand with the correct box size, and pretty soon a guy got in touch with me. I gave him instructions for removing the plastic without damaging the pull tab, and a week or two later I purchased 20 empty wrappers from him. They fit perfectly, and really rounded off the look of the package--but of course once you open the box and read the contents, you can never re-wrap it again. Hand-cutting and gluing each box, cutting, folding, and stapling the 20 booklets for the inside, and putting everything together takes about 20 minutes per copy. In this way, the Cigarette Comic ended up as an unintentional commentary on consumer culture. 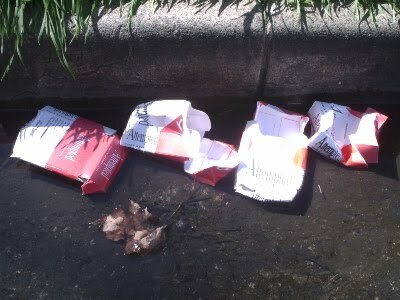 Cigarettes are not just something disposable, they are the most disposable thing of all. People who don't need them burn them just for the smoke produced in their destruction--and then throw away the butts and the boxes by the side of the road. The Cigarette Comic is the opposite of this throwaway culture, and a tribute to it at the same time. You can see the Cigarette Comic and other work at Attempted Not Known and Vidrio Cafe. From December 18 through March 13, you can see more of Peter Conrad's work at the Cartoon Art Museum.